Written By: Frances Goodrich, Albert Hackett, Frank Capra, Jo Swerling, Philip Van Doren Stern and Michael Wilson. From the 1939 short story “The Greatest Gift” by Philip Van Doren Stern. Why: ZuZu is the epitome of Christmas innocence. Shining Moment: When George realizes that he really IS better off alive then not… he reaches into to his pocket and finds the petals to ZuZu’s flower. He understands that he is back in the real world with his real family waiting for him at home. And no matter what other trouble might befall him, he has that love, and the love of his friends to rely on. Karolyn Grimes, the actress who played ZuZu in the movie, remembers making the movie 60+ years ago. She remembers Jimmy Stewart lifting her up for endless takes and gently setting her down each time after some one yelled “CUT”. She remembers Frank Capra squatting down to give her a direction. She only had 6 minutes of screen time in the movie, but it has stayed with her for a lifetime. … A lifetime that hasn’t always been so wonderful, frankly. Her mother died when Karolyn was 14, her father passed a year later, she went to a an unhappy “bad” home from there. But she got out and went to college and had a family and career as a medical technologist. But then her first husband died in a hunting accident. Her son committed suicide. Her second husband died of cancer. And she lost her life savings in the economic down turn in 2001. At one appearance, as Grimes analyzes the movie with the crowd, she asks them if they think ZuZu sees her father, George, hide the petals he can’t paste back on the flower? She thinks ZuZu is on to him. And that speaks to LIFE and Christmas too. It isn’t perfect. And it doesn’t have to be, but it can still be WONDERFUL if you let it. 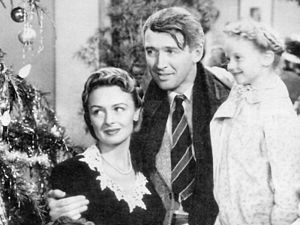 Some Christmas seasons you can’t swing a candy cane without hitting a showing of It’s a Wonderful Life on television. Sadly this wonderfully done movie has become part of the forced sentiment I like to call “Christmas Sausage” (That’s stuff YOU HAVE TO DO!!! to fulfill some one’s requirement of the Holiday) But this year, thankfully, it looks like the movie is only on once. So catch ZuZu, George, Mary, Uncle Billy and the rest of the gang at 8:00 pm Christmas Eve on NBC. 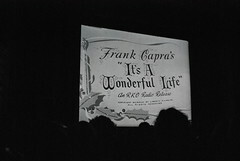 This entry was posted on Sunday, December 23rd, 2012 at 12:52 am	and tagged with Christmas, Frank Capra, It's a Wonderful Life, James Stewart and posted in Film, Frank Capra, It's a Wonderful Life, Jimmy Stewart, Secondary Character, Thought of the Day, United States, World War Two, ZuZu Bailey. You can follow any responses to this entry through the RSS 2.0 feed. What a wonderful post! I did not know anything about this woman but your retelling of her story is insightful. It reminds me of Miss Bates from Austen’s Emma. It is often in the minor characters we find a little gem. Poor-but-Popular-Mrs Bates is surprisingly popular for one with so few advantages. Miss Bates is quite a comic character but she is truly content. Yet her life didn’t give her much. We are invited to laugh but later re evaluate as she has found what my friend calls the ‘contentment gene’. Oh, Agreed! I think Miss Bates will make an appearance one of these Saturdays. She’s another of my favorites too.